At the beginning of 2003, we were far from what one would consider active birders. While we had an appreciation for all forms of wildlife, we frankly had no interest in identifying every avian that flew across our trail. Obviously, things have changed. In order to set the right tone for 2004, the Core Team decided to dedicate our New Year’s morn to birding. And where better to celebrate the enjoyment of bird life than the Mecca of NYC Metro birding, Jamaica Bay Wildlife Refuge. As a native New Yorker, I am never surprised by traffic conditions, except when they are light. That’s why I was stunned by how easy it was to get around yesterday. We made it from the Bronx to Jamaica Bay in about 30 minutes, no mean feat considering the bridges and highways one must cross. I advise anyone in the Tri-state area to mark this well and plan a drive into the city next January 1, just to see how nice it can be when everyone else stays home. On to the birds! Even in winter, Jamaica Bay is home to an impressive diversity of species. We were pleased to see birds like the Yellow-rumped Warbler and Northern Mockingbird. We also spotted a couple of Northern Harrier. But in this season, waterfowl rules the day. Jamaica Bay hosts three species of goose: Canada, Snow, and Brant. We saw both Hooded and Red-breasted Merganser. We also spotted lots of different ducks: Mallard, American Black Duck, Gadwall, Ruddy Duck, Bufflehead, and American Wigeon. We observed a raft of scaup, but we were too far away to tell if they were Greater or Lesser. Although we couldn’t count the scaup, we did see one new bird. 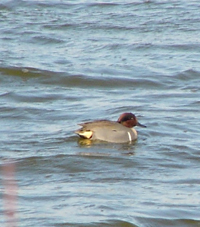 The male Green-winged Teal has a rich rust-colored head with an iridescent green face patch sweeping through eye. It is fast and agile, North America’s smallest dabbling duck. Two beautiful drakes swam by close enough for a picture and we happily obliged. There he is, the Core Team’s first new bird of the new year. What a handsome devil.